Immediate action was taken after maintenance in Strong Hall, which houses Chi Omega and Pi Beta Phi fraternities, led to the unexpected discovery of asbestos in the first-floor ceiling. A maintenance team had to remove asbestos from the ceiling of the lobby in the residence hall, where members of Chi Omega and Pi Beta Phi live, after responding to a call that a toilet had overflowed and a pipe was leaking in second-floor bathrooms of the building. University spokesman Kurtis Hiatt said the damage also affected a community room in the building. Staff removed asbestos from the lobby’s ceiling on Friday, and planned to replace insulation and parts of the ceiling over the weekend, Hiatt said. Air samples were taken and “there were no hazards to the GW community,” he said. On Friday, plastic tarps and red tape marked “danger” covered parts of the Strong Hall lobby as staff worked to repair the area. Over the weekend, the plastic tent was removed from the area. Asbestos, a naturally occurring mineral, can be found in insulation and ceiling panels, and is not fully banned in the United States, said Ana Ducoing, who teaches about asbestos at the Ecologic Training Institute in California. It is known to cause lung cancers like mesothelioma. She added that it can take from 10 to 40 years after being exposed to asbestos for people to develop symptoms of mesothelioma, but that it would be extremely rare for any student to develop a disease. “It would be extremely rare for anyone to have anything,” she said. He said his organization still plans to push for Strong Hall to be renovated this summer – an important backing for the historic building as officials designate different halls for upgrades. “We’re still fully committed to advocating for renovations to Strong Hall over the summer,” he said. 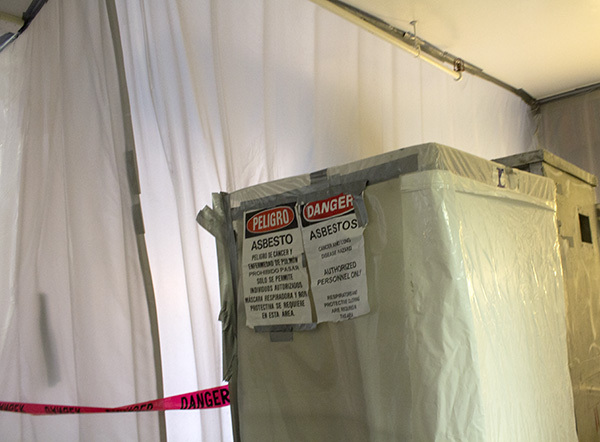 In August 2011, health and safety officials found asbestos in Rice Hall, where many administrators work, and in 2012, staff members worked to remove asbestos from the basement of Gelman Library. “I think [it] would be the No. 1 priority of the University as well,” she said. Chi Omega’s chapter president, Kate Mellinger, said in an email that she was working closely with GW to fix the problem “as soon as possible.” The chapter president of Pi Beta Phi did not return requests for comment.